The public secretary of the Movement for the Survival of Ogoni People (MOSOP) Mr Fegalo Nsuke has once more implored the Nigerian president, Muhamadu Buhari, not to renew the British-Dutch multinational oil and gas company (Royal Dutch Shell)’s licence to operate in Ogoniland. 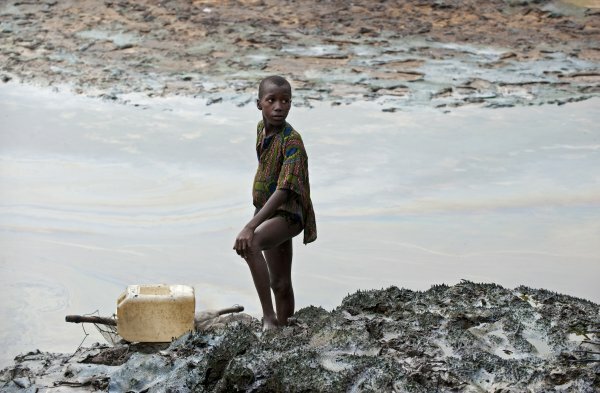 The Ogoni people, indigenous inhabitants of the Niger Delta in southeast Nigeria, have suffered for decades from the environmental pollution caused by the exploitation of their petroleum-rich homeland. The Ogoni people hope that the company’s oil mining leases expiring in 2019 will be revoked by the Nigerian central government. Movement for the Survival of Ogoni People, MOSOP, has expressed its opposition to the application by Shell Petroleum Development Company of Nigeria Limited, SPDC, for the renewal of its Oil Mining License, OML, in Ogoniland. MOSOP’s Publicity Secretary, Mr Fegalo Nsuke, in a statement, said: “We wish to unequivocally state our opposition to the application by SPDC for the renewal of its Oil Mining Licence in Ogoniland. “We want to make clear that the conduct of Shell in Ogoniland over the past 60 years had been genocidal, racist and have seriously jeopardized the safety and survival of over one million Ogoni people. “MOSOP therefore, urges the Nigerian president, Muhammadu Buhari, not to renew Shell’s license to operate the Ogoni oilfields as it expires in 2019. “We urge the Nigerian president to at least stand on the side of humanity and the suffering Ogoni masses whose lives have been rendered miserable by the operations of Shell in Ogoniland, polluting all drinking waters, destroying the ecosystem and livelihoods.